Lieutenant Kathy Rose began her career at the Geauga County Sheriff’s office in 1991 as a Corrections officer, became a Sergeant in December of 2000 and was promoted to Lieutenant in 2005. Lieutenant Rose is the Jail Administrator and oversees the operations of the Corrections Division which includes four Sergeants, 28 Corrections Officers, four full-time cooks, one full time nurse, a part-time physician, a Chaplain, a Drug and alcohol counselor and many volunteers. The facility has a capacity of 182 beds and is a full-service operation with many programs. 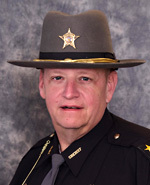 Lieutenant Rose oversees all daily operations of the facility including programs, housing for outside agencies, billing, maintaining compliance with the Ohio State Minimum Jail Standards, and training. Kathy is a graduate of Edinboro University of Pennsylvania with a Bachelor’s degree in Criminal Justice.